Yes, that's what one visitor to our stand at the Care Show said. 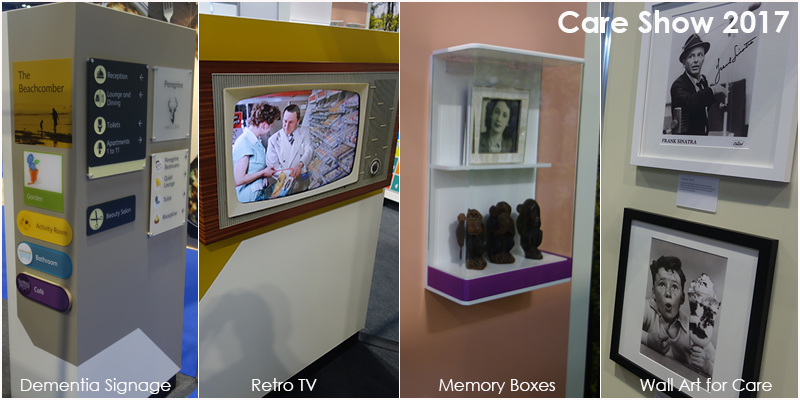 As well as our 'best ever' dementia signage, people were also pretty impressed by our memory boxes, retro TV, reversible mirror, false window and digital fish tank. Visitors got a sneak preview of a couple of ranges that are currently in their infancy - a range of framed pictures for care homes called Wall Art for Care and a giant snakes and ladders game - we enjoyed a few games during the show using our prototype model! We ran a prize draw over the two days to win a false window. This was won by Rachael Crocker for Mockley Manor Care Home in Ullenhall. Rachael said "That's great, thank you very much, our residents will love it! This is the one we saw at the show and we thought it was amazing." As well as the image boards that come with the window, they are also considering buying some other designs as they were so impressed with the product and what it will do for the home. If you came to see us at the show then thank you; it was really busy but we hope we got chance to talk to you properly. If you missed us, or were not able to be there this year you can still see the range of products we have by looking on our website and of course you can call us on 01274 728831 or send us a message.